One of the most affordable and durable breastmilk bags!!! 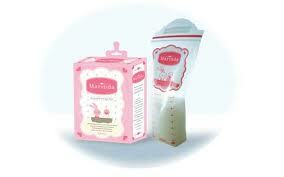 Marinda Breastmilk storage bag is made form 100% BPA Free plastic and has been designed neatly to support breastfeeding mother. Double zip closure and tamper-evident safety seal. Printing from water based color which is safer comparing to other chemical printing ink. Made from thicker plastic comparing other breastmilk storage helps eliminating leakage problem. All bags have been pre-sterilized for maximum hygiene.